Do you have a little one who loves horses or who dreams of attending the Kentucky Derby? 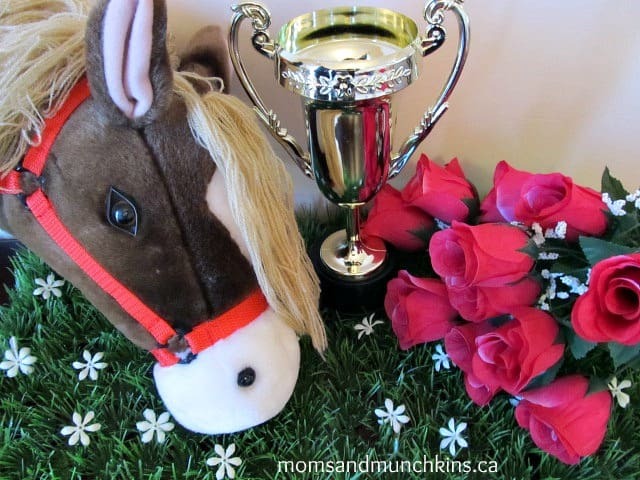 Then here are some fun Kentucky Derby Party ideas for you! Invite your little guests to the Winners Circle to celebrate your little one’s birthday. In your invitation you could use words and phrases such as “Winners Circle” and “Run For The Roses”. If you are familiar with the Kentucky Derby you’ll know that fancy hats are a large part of the atmosphere at the event. You can invite guests to bring their own fancy derby hat (the fanciest can win a prize) or you could have a fun craft at the party where children create their own hats – I’ll discuss this more in the activities section below. For your color scheme, use a lot of reds and blacks in balloons, table linens and dinnerware. You may also want to use a lot of roses as roses are a big part of the Kentucky Derby. Consider making a horseshoe wreath of roses for your front door to welcome guests to the party. You can then use this again in the Winners Circle – I’ll talk about some fun activities in the next section. There are plenty of activity ideas for a Kentucky Derby Party that are sure to keep the little ones active and laughing. Horse Races: You can do this quite a few different ways. Be sure to include a fun Grandstand area where the kids not racing can gather and cheer on the current racers. 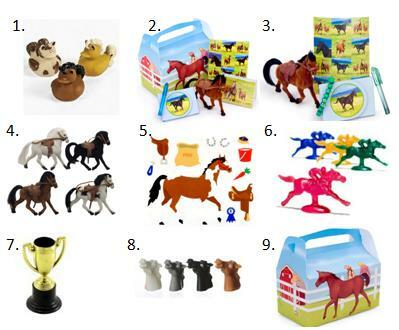 (1) Buy some wind up horses and provide each guest with one (a great addition to their loot bag). Have each little guest name their race horse. At the start of the whistle, each child winds up their horse and the first horse to cross the finish line wins that round. (2) Buy a small horse race game with a track. Have guests choose a horse and a name for their horse and then start up the game and watch the horses race to the end. 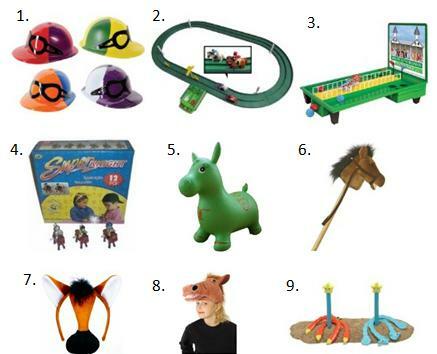 (3) Purchase a few ride-on horses like a bouncy horse or broomstick horse and some jockey helmets. Have guests name their race horse and then compete against each other in races across the finish line. (4) Buy a few little horse headbands and have the little ones be the horses. Have them name their horse characters and then race across a finish line. After each race, have a photo area set up (Winners Circle) where the kids can pose with their horse and the rose covered horseshoe trophy. Be sure that all kids get a chance to pose in the Winners Circle with their horses! This would be a great addition to the thank you cards. In all of the above games, you can let guests bet on who they think the winner will be. You could set up a small betting window where they place their bets on a piece of paper for each of the upcoming races. The person with the most correctly chosen winners at the end of all the races can win a prize. If you wanted to put together your race betting sheets before the party, you could ask in the RSVP for guests to name their race horse in advance. Horseshoes: Another fun game for the kids is to play horseshoes. This is a great game for kids of all ages. Derby Hats: As mentioned earlier, big fancy hats are a big part of the Kentucky Derby. You can purchase plain foam hats or visors from your local craft store along with ribbons, feathers and flowers and each guest could create their own fancy derby hat at the beginning of the party. The kids can gather for a fun group photo to showcase their derby hat creations – a great addition to the thank you cards! 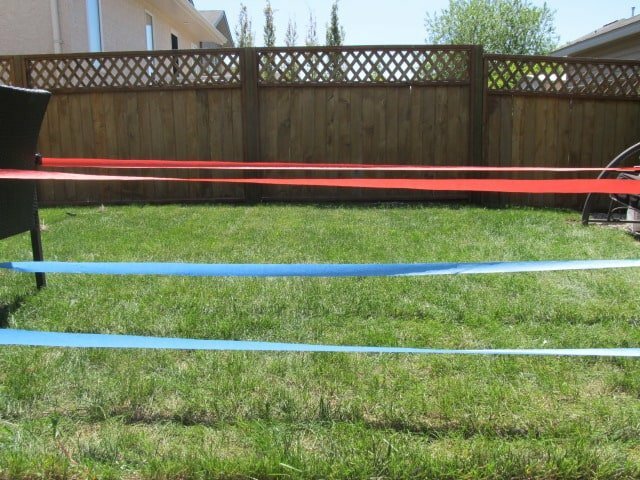 Horse Jumping: Using chairs or pegs in the ground and streamer paper, create jumps for your little horses to jump over. Your food area could be called the Jockey Clubhouse. You could serve some fun southern food here or small finger sandwiches. You may also want to include a horse feeding station – because I’m sure that the horses will be hungry too after all that racing – and provide horse snacks like carrot sticks. There are many fun ideas for a Kentucky Derby themed cake. 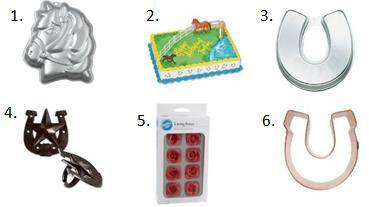 You could use a cake mold to create a horse or a horseshoe cake covered in roses (like the Winners Circle trophy). Cupcakes iced in black icing with red icing roses are also a fun idea. You could even include a few horseshoe cookies for snacks. Mint Julep is the official drink of the Kentucky Derby. You can find a non-alcoholic recipe here. You could also try an easy punch using lemon-line soda and a red Kool-Aid. In addition to the fun hats the kids created or the wind up horses that they used for the games, here are a few other fun ideas for loot bags. Fun fun and easy idea is to use plastic gold trophies as loot bag containers and let the kids fill them from a candy buffet. Have you ever been to a horse race? *Disclosure: I am part of the Amazon.com & Birthday in a Box affiliate programs. All opinions expressed here are 100% my own. So much fun! Great for anyone that loves horses! Thanks for linking! Cute! I would love for you to come by and share this post on the Creative Corner Hop. The linky party starts on Monday and stays open all week.